DcBooks is a utility application for Windows that will strip the DRM encryption from your Mobi and Kindle ebooks for the purpose of making them easily portable between devices and between software readers. It cannot decrypt ebooks that were purchased by other people. DcBooks processes all your books in a single one-click operation. DcBooks is fast, decrypting about two books per second on an average computer. DcBooks is not written in Python! Not modify, rename or alter your original files in any way. The input files retain their DRM encoding. Automatically determine your Mobipocket Reader and/or your Kindle for PC content folder for input. DcBooks will not ask you to find these folders yourself. Allow you to select an output folder of your choice, with the limitation that the output folder must be different to the input folder(s). Automatically determine the DRM PIDs for your books. DcBooks will not ask you for any decryption keys - it either finds them on your computer or it cannot decrypt. Automatically ignore duplicates with different names in the input folder(s). It also detects different files with the same name if both input content folders are in use. Automatically ignore any books present in the output folder that have already been processed, even if they have been renamed. Replace obscure "stock number" file names with comprehensible author name and book title names in the output folder. If different files resolve to the same name, an index number will be automatically added. All output files are given the extension ".mobi", this being the most commonly used extension for unencrypted books. Simply copy any unencrypted books encountered in the input folder(s) to the output folders. These files still benefit from the renaming feature and you then have your complete unencrypted Mobi library in one place ready to be transferred onto your new device. To decrypt Mobi ebooks you must have Mobipocket Reader installed and the books downloaded or copied into it. You can decrypt books copied from a device if the PID for this device is registered in Mobipocket Reader. This feature is useful if you change computers and your original Mobipocket Reader PID is no longer valid. You can't open these files in Mobipocket Reader but, if they are in the standard content folder for Mobipocket Reader, they can be decrypted by DcBooks (then they can be opened in Mobipocket Reader). To decrypt Amazon Kindle ebooks you must have Kindle for PC installed and the books downloaded to it. 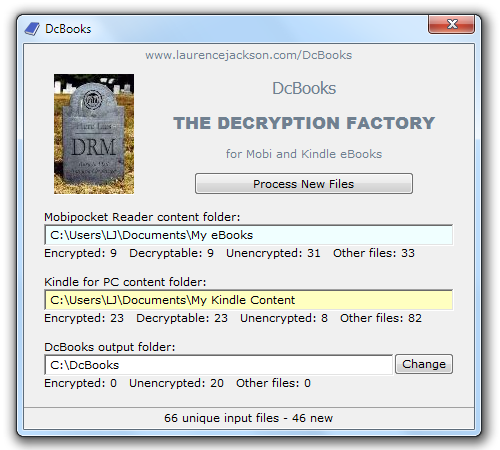 DcBooks cannot decrypt ebooks copied from your Kindle device because the files are differently encrypted. 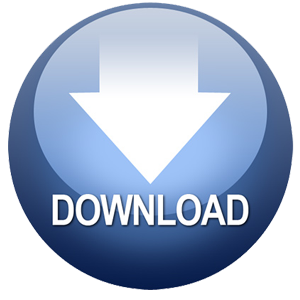 The output files produced by DcBooks can be transferred to any device or software that is capable of reading Mobi files, including Amazon Kindle. You cannot change the content (input) folder paths. These are determined from registry entries. The output folder initially defaults to C:\DcBooks, but this can be changed if required. If you change the output folder, this will be remembered for subsequent runs of the program. Below each folder path is the number of encrypted books, the number of decryptable books (not given for the output folder), the number of unencrypted books, and the number of other, unrecognized, files. If both the Mobipocket Reader content folder path and the Kindle for PC content folder path boxes are blank, DcBooks was unable to find any Mobi books on your computer and so is unable to do anything. Both the "Process New Files" and the "Change" (output path) buttons will be disabled. All you can do is exit. If either or both the Mobipocket Reader content folder path and the Kindle for PC content folder path boxes are filled, then we are in business! DcBooks checks for the number of unique new files (not already in the output folder) and displays the results in the status bar at the bottom of the dialog box. If you change the output folder, these results will be updated. Click the "Process New Files" button to decrypt or copy all new files to the output folder. As the files are being processed, DcBooks replaces the idle screen graphic (shown in the screenshot above) with the cover thumbnail, author name, title and language of the current book. If a large number of files are being processed and you want to abort, simply click on the red exit button in the corner of the dialog. The book currently being processed will be completed and the application will terminate. The next time you run it, DcBooks will determine which of your books remain to be processed. If you examine the output folder with a file explorer, you may find one or two file names that you want to manually tweak. DcBooks does its best with the information available, but sometimes that information is very poor. Go ahead and adjust the name manually if you want to. DcBooks will still recognize the book as equivalent to one in your input folder and will not overwrite it in the future. DcBooks does not maintain file lists and uses the file contents, not the name, for identification and comparison. If you have decrypted all of your books and then you acquire another encrypted book that you want to unlock, just run DcBooks again and it will detect the new book if your previously processed books remain in your output folder. When you click "Process New Files", just that one book will be processed and copied to the output folder. All of your previously processed books will be unaffected, even any that you may have manually renamed. Most Amazon ebooks with an "azw" extension are in Mobi format, although the DRM protection is different from Mobipocket "prc" or "mobi" files. A few "azw" files are in Amazon's own "Topaz" format. DcBooks cannot decrypt files in Topaz format. It considers these files to be in the "Others" category and does not copy them to the output folder.